It is funny to me that when I am suffering with a cold as I am this week, my body starts craving super healthy foods. For instance, today my body was asking for green juice, so I pulled out all of my veggies and got to juicing. And now as we begin to enter the official cold and flu season, I am looking at ways to boost my immunity. I haven't ever gotten much into the so-called 'superfoods', but am willing to give goji berries a try. Here is some info on goji berries from WebMD and a yummy sounding smoothie recipe from the Dr. Oz Show. The goji berry is also called the wolfberry. It is a bright orange-red berry that comes from a shrub that's native to China. In Asia, goji berries have been eaten for generations in the hopes of living longer. Over time, people have used goji berries to treat many common health problems like diabetes, high blood pressure, fever, and age-related eye problems. 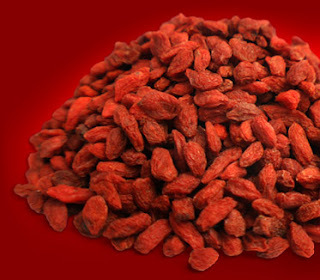 Goji berries are eaten raw, cooked, or dried (like raisins) and are used in herbal teas, juices, wines, and medicines. Research shows that eating berries -- like blueberries, acai berries, cranberries, strawberries, and cherries -- offers some definite health benefits. Berries like the goji berry are filled with powerful antioxidants and other compounds that may help prevent cancer and other illnesses, including heart disease. Eating foods high in antioxidants may slow the aging process. It does this by minimizing damage to your cells from free radicals that injure cells and damage DNA. When a cell's DNA changes, the cell grows abnormally. Antioxidants can take away the destructive power of free radicals. By doing so, antioxidants help reduce the risk of some serious diseases. Goji berries also have compounds rich in vitamin A that may have antiaging benefits. These special compounds help boost immune function, protect vision, and may help prevent heart disease. Some research suggests that goji berry extracts may boost brain health and may protect against age-related diseases such as Alzheimer's. While goji berries are a rich source of antioxidants -- and early research shows a potentially powerful health benefit -- it's still unclear how they stack up against other berries. Researchers also don't know whether goji berry supplements have the same health benefits as the actual berries. Do goji berries have any dangerous side effects? There may be some possible herb-drug interactions with goji berries. If you take warfarin (a blood thinner), you may want to avoid goji berries. Goji berries may also interact with diabetes and blood pressure medicines. Also, if you have pollen allergies, you may want to stay away from this fruit. However, when eaten in moderation, goji berries appear to be safe. Goji Berries are big fun. I love adding them to all kinds of things. I even have a little bowl of them just sitting on the counter next to a bowl of raw cacao nibs and hemp seeds - all for quick snacking. Yum! frozen package. How many ounces of frozen berries should I use? The frozen pkg I buy is 3 lbs. Sylvia, I just dump in the equivalent of a handful of frozen blueberries usually. Nothing needs to be exact. Goji facilitates the secretion and release of hGH, which is responsible for many of the body’s important maintenance, repair and development functions. These include the production of lean muscle and the incorporation of calcium into the bones and teeth. It can also help to improve our eyesight. No need to wear eyeglasses with Goji Berry. If we stopped Goji Berries then we should start wearing eyeglasses!